Brain is a warrior turned mercenary after he lost to Gazef Stronoff in a grand tournament to determine the strongest fighter in Re-Estize Kingdom. 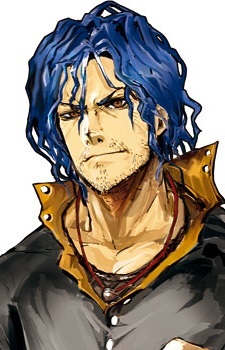 He has brown eyes with blue hair and the appearance of a wild beast. He is equipped with a chainmail and wears a necklace and ring which are infused with protection magic. His whole body is lean and his muscles are tough as steel and tempered through experience. When first introduced he is very arrogant, thinking that he is the most powerful, even though he earlier lost to Gazef. His personality changes drastically after having a run in with Shalltear. Having his confidence completely crushed and getting a feel of what true terror is like, his attitude changes to one where he is completely depressed, hinting at a suicidal tendency. He eventually does a complete overhaul after meeting Climb and Sebas Tian. He changes to a much friendlier person that starts to think that strength is more than simply being skilled with a sword. Originally a farmer, he was gifted with what could only be described as a god-given talent in the mastery of the sword. He has always believed himself to be the strongest fighter inside the Kingdom, having never lost a fight before he entered the grand tournament to decide the King's guard captain. He easily fought his way to the final where he faced off against Gazef Stronoff. A grand and close battle ensued between the two, but eventually he would taste his first defeat at the hand of Gazef. In the web novel version, he becomes a vampire under Shalltear.